The Ravens could get at least $2 million in salary-cap room by giving Marshal Yanda an extension. Defensive tackle Haloti Ngata isn't the only Baltimore Ravens player who should get approached about a contract extension. Pro Bowl guard Marshal Yanda should get a multi-year deal that will allow him to retire with the team. Like Ngata, Yanda is in the final year of his contract. Unlike Ngata, there's no chance of the Ravens cutting Yanda. That shouldn't lessen the importance of getting an extension with Yanda. In fact, it makes too much sense for it not to happen. The Ravens can get much-needed salary cap room (at least $2 million), and Yanda can double what he would earn this year. The Ravens can make sure they'll have one of the NFL's best offensive linemen for the next four to five years, and Yanda can get the opportunity to be a Raven for life. Entering the final year of his five-year, $32 million contract, Yanda has a salary-cap number of $8.45 million, which is the fourth highest on the Ravens and the fourth highest among NFL guards. But the Ravens aren't going to release him even though it would create $5.5 million in cap space. Yanda's $5.5 million base salary is a relative bargain when you consider four guards are making over $6 million in 2015. Yanda is playing as well as he's ever played in his eight-season NFL career. He's a mauling run blocker and steady pass protector. Yanda is a leader by example and is one of the most respected players on the team because of his toughness. In 2014, he was named a first-team All Pro by the Associated Press and was the highest-graded offensive lineman by Pro Football Focus. Former Ravens offensive coordinator Gary Kubiak called Yanda the best lineman he’s ever been around. “I'm so impressed with the technician that he is, how hard he plays, how tough he is, the things he plays through,” Kubiak said. “He's a consistent body of work." 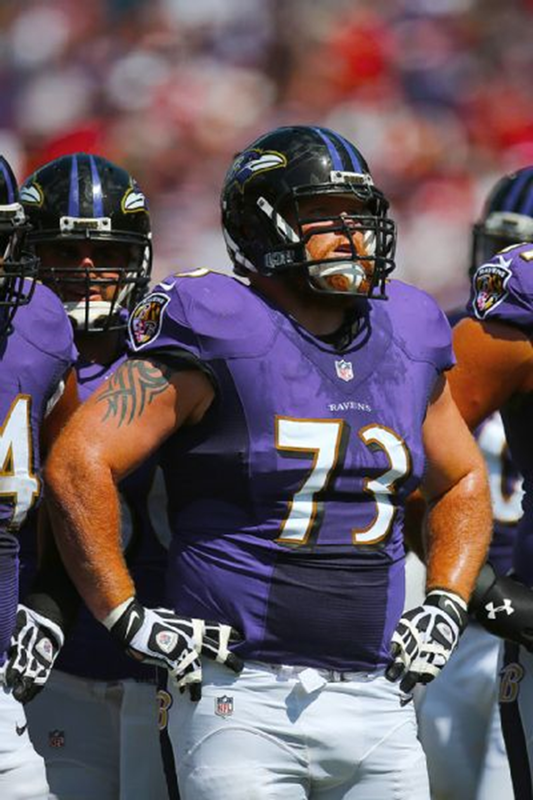 A contract extension really is a win-win situation for Yanda as well as the Ravens. Given that the average salary of the top five guards is $7.67 million, the Ravens could offer Yanda a four-year extension worth $30 million (an average of $7.5 million per year). A signing bonus around $12 million would more than double what Yanda would earn in the final year of his deal ($5.5 million). The Ravens would reduce Yanda's cap number by at least $2 million. Even though Yanda will turn 31 a couple of weeks into the regular season, there is little concern of Yanda wearing down. He is among the most dependable players on the Ravens, and he's played 99.4 percent of the Ravens' snaps the past two seasons. Getting an extension done would be a smart decision for the Ravens as well as Yanda.